Opening Night of the 2016 Christmas Night Lights At the Naples Botanical Gardens! Children Come for Free! The Harvard Club of Naples cordially invites you to join us in the Naples Botanical Gardens for an evening of fun and music at the Opening Night of the Garden's 2016 Christmas Night Lights. The Naples Botanical Garden's sparkling "Night Lights" event has quickly become an annual tradition in Naples. Each evening is filled with holiday musical performances, family activities, and fascinating light exhibits throughout the gardens. This event is a magical end to the year and a special way for visitors of all ages to enjoy the Garden at night. The Garden has released more details on the specifics of this year's Night Lights and, in addition to the Origami in the Garden exhibit detailed below, musical performances by music duo Patchouli & Terra Guitarra, the Rick Howard Duo, and harpist Kim Adamson & cellist Jeannine Cavalier will be featured. Three for All, a group of strolling carolers, will also be performing. 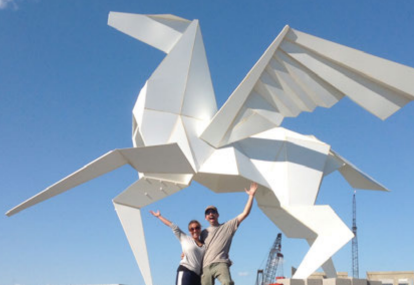 The Origami in the Garden exhibit is a monumental outdoor scuplture exhibition of over 30 scupltures created by American artists Kevin and Jennifer Box. From giant paper cranes to a life-sized Pegasus, Kevin and Jennifer Box have pioneered a new method of capturing the delicate detail of paper into museum-quality metals utilizing lost wax casting and fabrication techniques. Come and join us for a fun evening! Cost: $20 Per Person; Children ages four to fourteen can attend for free but prior registrations are required and space is limited. Children under age four can attend for free and do not need to register.